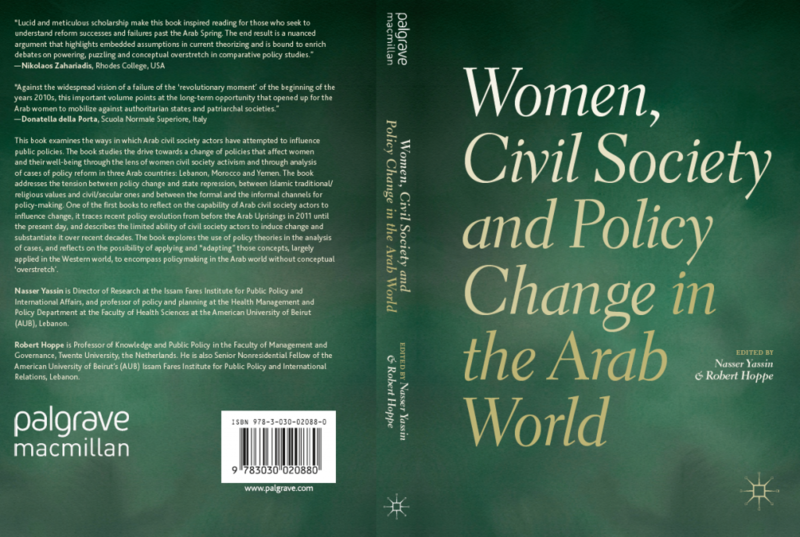 The book Women, Civil Society and Policy Change in the Arab World was published by Palgrave Macmillan in February, 2019. This book examines the ways in which Arab civil society actors have attempted to influence public policies. In particular, the book studies the drive towards a change of policies that affect women and their well-being. It does so through the lens of women civil society activism and through analysis of cases of policy reform in three Arab countries namely: Lebanon, Morocco and Yemen. The book addresses the tension between policy change and state repression;between Islamic traditional/religious values and civil/secular ones; between the formal and the informal channels for policy-making. One of the first books to reflect on the capability of Arab civil society actors to influence change, it traces recent policy evolution from before the Arab Uprisings in 2011 until the present day, and describes the limited ability of civil society actors to induce change and substantiate it over recent decades. The book explores the use of policy theories in the analysis of cases, and reflects on the possibility of applying and “adapting” those concepts, largely applied in the Western world, to encompass policymaking in the Arab world without conceptual ‘overstretch’. As a sort of follow-up to this book, ICPP4 features a panel, T03P05, Politics and Policymaking in MENA Countries After the Arab Uprisings. Nasser Yassin is Director of Research at the Issam Fares Institute for Public Policy and International Affairs and Robert Hoppe is Professor of Knowledge and Public Policy in the Faculty of Management and Governance, Twente University.